Bobcats don't do a lot of running, yet they can reach speeds of 25 to 30 mph in short bursts. They lie in wait for prey or stalk it, rarely needing to run it down. Their greatest hunting power may be their pounce. A bobcat can leap 12 feet to take down prey. The bobcat's average life span in the wild is only three to four years but they may up to 12 years. They are fairly small, weighing only 11 to 30 pounds and measuring at most 41 inches long. They mainly eat small animals including rabbits, squirrels and mice. They'll eat other small mammals who are available in their location, such as beavers, hares and prairie dogs. They also feed on birds and infrequently on large animals such as deer, especially in the winter. A bobcat's territory varies based on the food supply, in certain areas averaging four to 15 square miles, according to the Palomar College website. 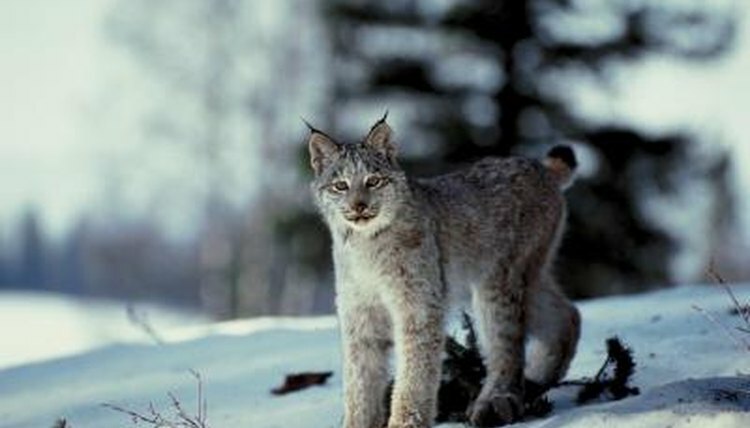 In New England, a male bobcat's territory comprises approximately 36 square miles and a female's territory is one-third that size, the Squam Lakes Natural Science Center website reports. Bobcats swim and have no aversion to water, so creeks and rivers don't get in the way of their hunting. Instead of running after prey, the bobcat will ambush it, often from a tree. The bobcat also hunts from the ground and may wait hours near an animal trail. The powerful springing pounce can kill the targeted animal on contact. Bobcats often zigzag through their territory, moving slowly. They move at a rate of about 10 to 65 yards per hour and cover from about a mile to 11 miles a day, according to "Wildcats of the World." They cover the greatest distances during the mating season. Males tend to move faster than females. Although often nocturnal, they may hunt at any time and they patrol their territory every day. Even though his hunting style doesn't often require running, a bobcat will run when he needs to. His powerful legs and skill at climbing trees allow him to leap away from danger. Likewise, he can reach his top running speed to obtain food or save his life. His main predators in certain locations are coyotes and pumas. He'll sprint in pursuit of a rabbit or other desired meal, but doesn't engage in prolonged chase. If the quarry eludes him, he moves on. Deer can outrun bobcats, especially in snow, so a bobcat usually only will attack a deer who's lying down. Wilcats of the World; Mel Sunquist, et al.